Supported by PCS, The Unity Theatre Trust and the Barry Amiel Trust. 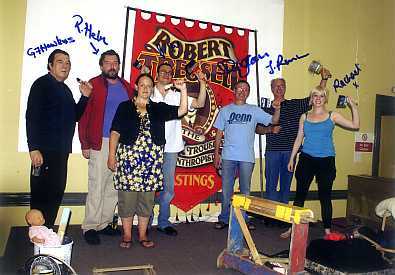 A dramatic adaptation of Robert Tressell's famous novel about working-class life has toured North West venues, and the tour has ending down South with a final performance in Hastings (The Mugsborough of the book) at the Robert Tressell Festival, on 4th July 2009. Steve’s previous acting roles include: ‘NO FOOL LIKE AN OLD FOOL’ based on The Merchant’s Tale by Chaucer – ‘BON VOYAGE’ by Richie Grice & Paul Nicholson & a previous production of ‘THE RAGGED TROUSERED PHILANTHROPISTS’. Steve is also a performance poet and building worker. Hilly has worked extensively in theatre for the last 20 years. Productions include her one-woman show “Does This Perfume Make me Look Fat” and “Hilly Barber and the knickers of Doom.” TV Credits include Emmerdale. Rachael trained at L.I.P.A. & since graduating in 2005 her credits include ‘JULIET’ in ‘ROMEO & JULIET’ – with the Manchester Actors Company. – ‘CAROL’ in ‘BEER’ at the Contact Theatre & ‘LISA’ in ‘WIRE IN THE BLOOD’. Rachael also performs stand-up comedy characters at various venues across the north-west. Gerard is an honours Licentiate to L.A.M.D.A. & has been a professional actor for 20 years. As well as his Shakespearean roles, he has covered many genres in the theatre both classical & contemporary. His many roles include, ‘KING LEAR’ - ‘SHYLOCK’ - ‘BOTTOM’ - ‘AL CAPONE’ – ‘SQUEALER’ in ‘ANIMAL FARM’ & ‘PANCRAZIO’ in ‘THE VENETIAN TWINS’. His own play ‘PALS’ about the Liverpool Pals who fought in the First World War was critically acclaimed. After leaving Webber Douglas Drama School, Richard went on to become a highly versatile professional actor of some 30 years standing. His multitudinous roles include: ‘ALEX’ in ‘A CLOCKWORK ORANGE’ – ‘JACK’ in ‘PALS’ – ‘BOXER’ in ‘ANIMAL FARM’ – ‘GEORGE’ in ‘OF MICE & MEN’ – ‘LARRY PARNES’ in ‘LIKE I’VE NEVER BEEN GONE’ & ‘FATHER MALCOLM’ IN ‘PEAS’, plus his numerous improvisational shows for the late Ken Campbell. Paul recently played Noel Chavasse in 'Chavasse: VC and Bar' at Liverpool Cathedral. Other recent work includes “Kineseology”, premiered at Cannes, a devised project at Feltham Young Offenders Institution, “Follow” at Finsborough Theatre, and “The Winter’s Tale” at the Wirral Shakespeare festival. An age of boom and bust, of cut throat competition, high unemployment, a decimated building industry, corruption and shameless robbery by the rich. That's exactly the point Tressell was making in his book “The Ragged Trousered Philanthropists”, set in the early 19 th century. The arguments about how to manage the continual crises of Capitalism are a red herrings as far as ordinary people are concerned – Protectionism or Free Trade, it hardly matters to the person on the street. The only thing that will help them is a major restructuring of the system, replacing it with a way of life that is based on compassion, co-operation, not selfish greed and savage competition. Tressell was not afraid to promote Socialism as the alternative. It was his polemical style and courageous vision that made the book so popular. It looked at the relationships between boss and worker in a more direct, unsentimental way than anything before in literature. Perhaps a new look at Tressell's work can uncover some of the idealism that inspired him and his generation, and help give Socialists in Britain impetus for rebuilding their strategy for ending the disastrous system we're living under at the minute. 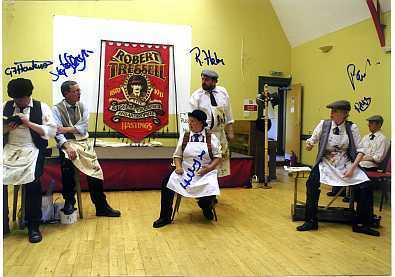 This adaptation of The Ragged Trousered Philanthropists was first seen in Liverpool last year, where the PCS union put it on as part of the Union 08 celebrations. Here are some of the things people said about it. "We are delighted to say that this is the best production of this important work that we have seen"
 John Fay, Writer, Coronation Street. Please support the tour and help generate an alterative vision for our society. Dingle Community Theatre kindly agreed to act as banker for the tour and provided a summary of expenditure and income at the end of the project.